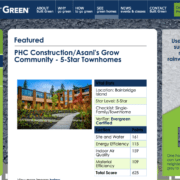 Grow Community is all about making smart choices for the Earth – how we build and how we live. 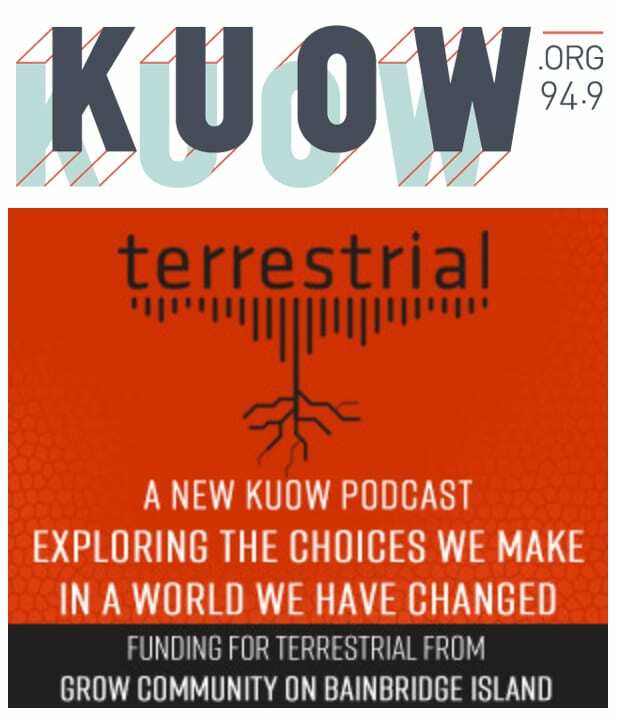 Now we’re proud to sponsor the new podcast “terrestrial” on local radio station KUOW, exploring “the choices we make in a world we have changed.” Host Ashley Ahearn travels the country — from ranches in Oregon to churches in Colorado — to bring listeners stories about people making personal choices in the face of environmental change. 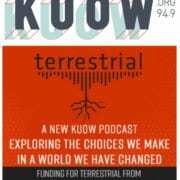 Subscribe to “terrestrial” through Apple podcasts, or listen online at here. If it wasn’t a challenge, it wouldn’t be worth doing. That’s the conclusion of Dwell magazine, which spent time at Grow Community recently and liked what they saw. Read this great feature online at www.dwell.com. Weather-tight outside, snug and warm within. 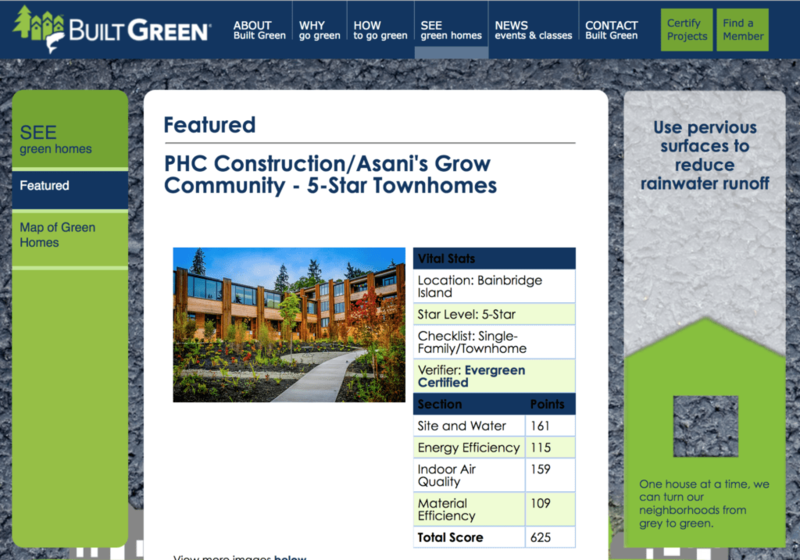 Built Green gives Grow Community phase 2, the Grove, a prestigious 5 Star rating in its new online feature. 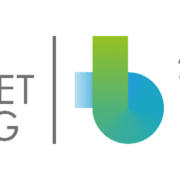 Built Green helps homebuyers find quality, affordable homes that offer opportunities to protect the health of their families and the Northwest environment. 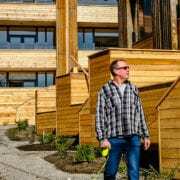 Built Green homes are designed to provide homeowners with comfortable, durable, environmentally friendly homes that are cost-effective to own and operate. 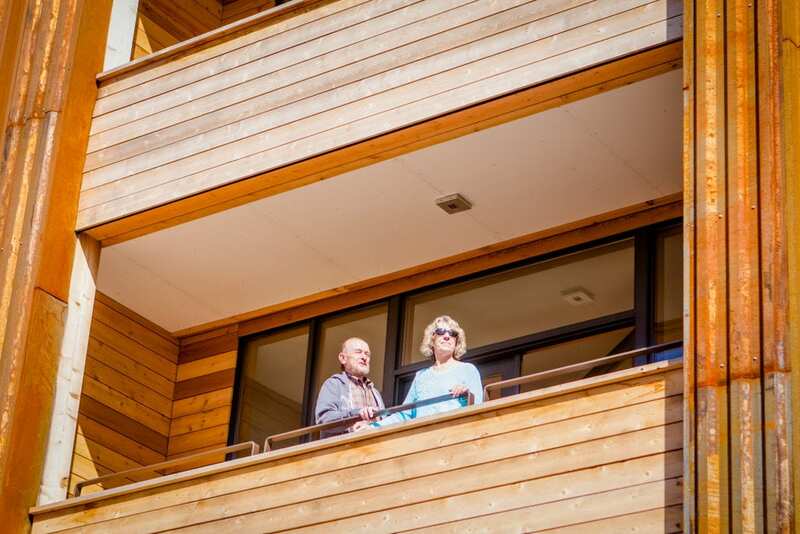 These resource-efficient homes are crafted to exceed building codes and provide homeowners with years of healthy, quality living, while protecting our families and the precious Northwest environment. Read the Built Green feature on Grow Community here. 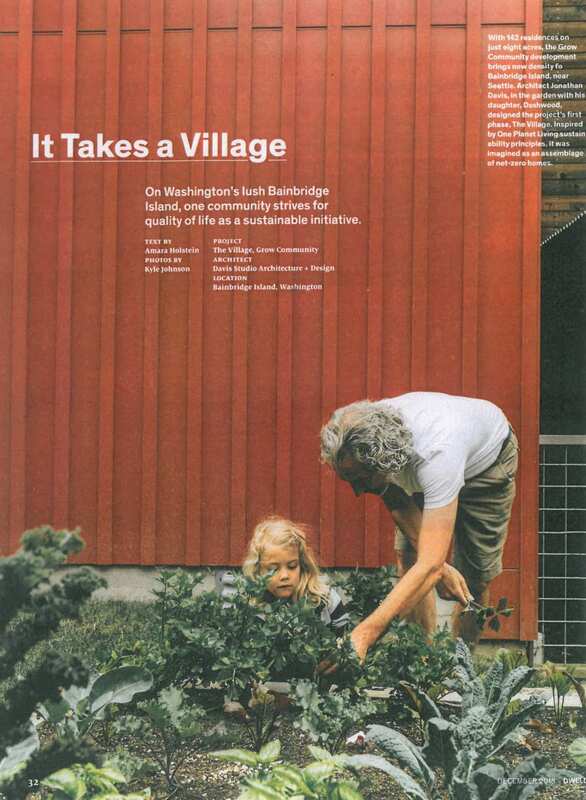 When we set out to design the most sustainable, future-friendly community possible, we knew we were building more than homes. We were creating a whole new way of living, and a model for the world. We started with the principles of One Planet Living – promoting sustainable, healthy lifestyles through low-impact construction and high-quality materials. Culture, community, equity and economy were our guiding principles, health and happiness our end product. We haven’t backed down from the challenge. Homes in our first two neighborhoods, the Village and the Grove, have earned national and international acclaim for their thoughtful design and construction. 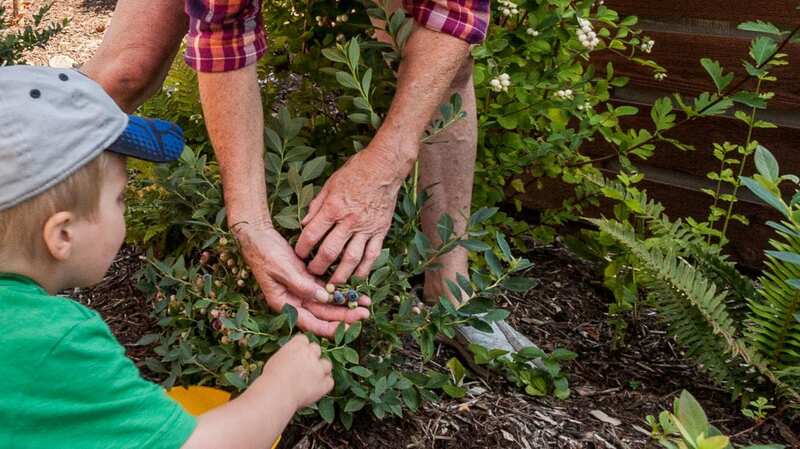 Each neighborhood is designed around vegetable gardens, fruit groves or open spaces, with native plants and vegetation creating natural and inviting places for children and adults to enjoy. 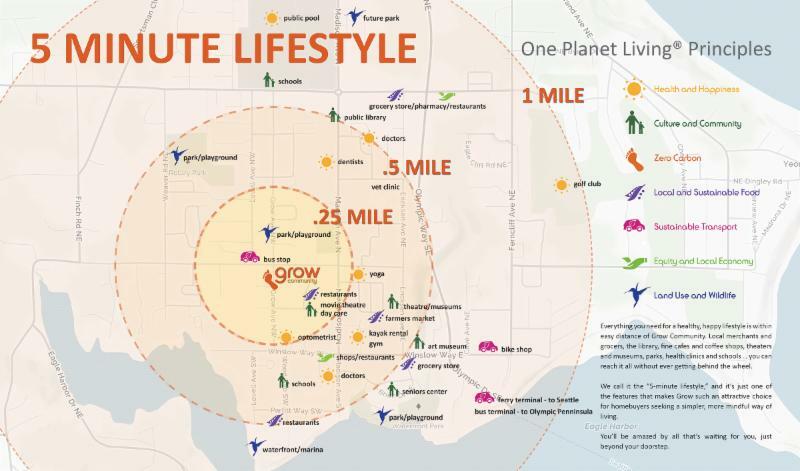 Grow offers a “five minute lifestyle” where residents can walk/ride/roll to local amenities and urban attractions in Winslow town center, reducing dependency on the automobile. Spacious designs offer room for families, while single-level living options mean owners can age in place in security and comfort. We’re all about bringing people together – a new community center will provide a space for classes, gatherings and community events, bringing residents and neighbors together throughout the seasons. Along the way, Grow has become the largest planned solar community in Washington state – with more clean energy-producing rooftop PV systems being added all the time. As we enter our third and final phase, the Park neighborhood, we’re proud of what we’ve achieved. A healthy community of satisfied residents and, we believe, an inspiration that others can follow for forward-thinking, sustainable urban design. Visit Grow Community today, and let us share it with you – a new way of living, at one with the future and the world. The most comfortable retirement home is your own home. On this point, older Americans widely agree: three-quarters surveyed say their number one goal is to stay in their own home as long as possible, in the familiar environment of connections, routines, heirlooms, memories, and friendships. Independent living is a primary concern for both the older generation and their adult children, studies show. “Aging in place” has become the mantra for “baby boomers” and those who follow, describing a long-term goal once aspirational and now, at Grow Community, quite reachable. Maintaining a healthy generational mix is a foundational goal of the Grow project. 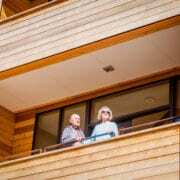 Helping residents age in place — and keeping older homeowners an active, vital part of the social blend — guides the layout and amenities. Long-term accessibility is being built into new Grove and Park neighborhoods from the ground up. That starts with single-level living in most units, keeping bedrooms, kitchen, bathrooms and utility spaces united on a single floor. Residents will have no cumbersome trips up and down stairs through the day. On the outside, elevators connect underground parking areas with the entryways of each home. Asani LLC, hired to develop Grow Community, worked to provide as much of the accessibility options into the design as possible. Features like Walk-in showers large enough for seating, open floor plans with minimal hallways, and taller comfort toilets are standard design elements at Grow Community. These can be enjoyed at any age and have been identified as key to independent living. Grow Community is in the vanguard among residential projects bringing innovative strategies for independent living to market. Situated in the heart of Winslow town center, Grow homes are close to grocers, restaurants, merchants and professional services, eliminating the need for regular automobile use. A community center will allow neighborhood activities, while being flexible enough to fit the communities own programming desires. The eight-acre grounds boast spacious community gardens and gathering places. Together these amenities fulfill goals identified by Congress in 2006 with reauthorization of the Older Americans Act, which urged locally based initiatives to meet aging citizens’ needs including services, social opportunities and recreation. “It’s all part of our goal to create an intergenerational community, which has been our thinking from the beginning,” Lotakis says. Aging in place also makes sense for seniors for whom long-term financial independence is a paramount concern. The average cost of residence in an assisted living facility, for one bedroom and single occupancy, is approaching $40,000 per year, the Association for the Advancement of Retired Persons reports – a prohibitive amount for fixed-income seniors, who have already spent years building up equity in their own home. The multigenerational family under one roof is another American trend. A significant number of older residents have had a grown son or daughter, often with children of their own, move back in. In these families, the younger generations themselves become a resource for aging in place – not an option if their elders have moved into retirement homes or assisted living facilities. With spacious two- and three-bedroom floor plans, Grow Community’s new Grove and Park neighborhoods anticipate these needs for a range of homebuyers, beginning with those in middle age who are looking to downsize and settle in for the long term. For those already in their senior years, Grow Community offers some very good reasons to move just one more time. It takes a lot of work to make sustainability simple. 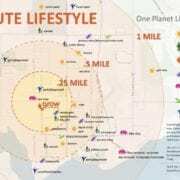 But making the choice of a low-impact lifestyle easy for buyers was the goal at Grow Community from the very start. 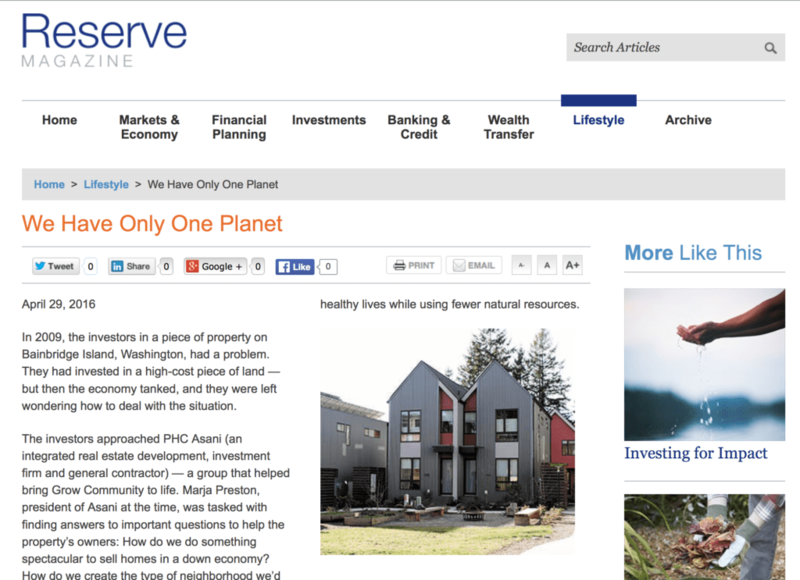 In an article titled “We Only Have One Planet,” Reserve Magazine explores the history of Washington’s largest planned solar community, and the thoughtful features that have earned it the prestigious One Planet Living certification. Leading elements of Grow’s high-performing homes include rooftop solar arrays, airtight construction and insulation, and nontoxic construction materials, among other low-impact features. 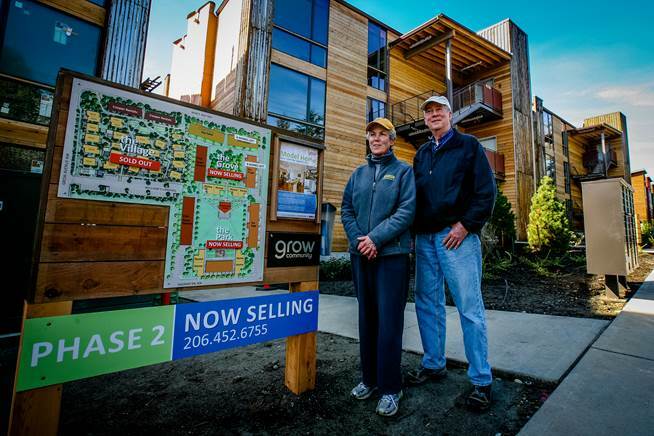 Grow homes use 30 to 40 percent less water than a typical Pacific Northwest home, the magazine notes. 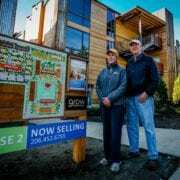 It all adds up to a formula for sustainable, intergenerational living. Grow does the hard work, so residents can get on with the fun stuff: living. 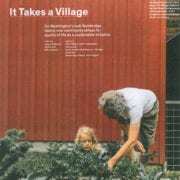 “This idea that we can start to create places where generations share space, where elders pass along wisdom, where you have children who are being looked after by friends or grandparents and where young couples or single folks get a chance to live in a community where there’s a mix of support — to us, it’s a recipe for success in the future,” Greg says. What’s the Grove all about? As we welcome our newest residents to the Grove neighborhood, we should pause to reflect on what’s drawing discerning buyers to the latest homes in our award-winning Grow Community. We promised urban living with nature at every doorstep, and that’s what we’re delivering. Homeowners in Grove buildings will enjoy close connection to the signature woodland that gives this corner of Grow its name. A mix of native trees and understory will bring the Northwest forest into the very heart of the neighborhood, complementing the fruit trees and gardens thriving elsewhere around the project. Ultra-efficient home construction, renewable materials and low-impact fixtures promise a healthy lifestyle within each of these 5 Star Built Green homes, while our rooftop solar arrays allow residents to ease their reliance on the grid – and even put power back into it for others to use. Our generous open spaces and community gardens – inspired by centuries-old European towns, designed around central squares and greens – promote connection and interaction, really putting the “neighbor” in our neighborhoods. We put the focus on intergenerational living in the Grove, imagining homes as inviting to a 73 year old as a toddler. Sixty percent of homes will be fully accessible, with convenient single-level living and private elevators from our parking garages that will let residents “age in place” by design. Oh, and about that parking – it’s underground, keeping vehicles off the street and out of sight while letting us preserve so much open space between homes. Proximity to Winslow’s urban core means local merchants, services and amenities are just steps away along the public paths that radiate out from Grow Community’s neighborhood core. As the Grove takes final shape and we turn our attention to our third and final neighborhood, the Park (centerpiece: yes, a park), we are proud of what we have accomplished and how our vision has translated in the market. Most of all we’re delighted for our many new neighbors and friends of Grow Community. https://growbainbridge.com/wp-content/uploads/2016/02/woof3.jpg 1000 579 Grow Team https://growbainbridge.com/wp-content/uploads/2018/05/growlogo-300x110.gif Grow Team2016-02-28 21:53:042017-01-30 23:47:53What's the Grove all about? 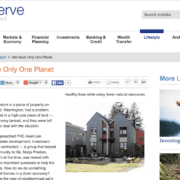 One planet, one community, and one goal: a new model for sustainable living. Grow Community was founded on the principles of One Planet Living, proving that from design and construction to the choices we make as neighbors, we can live within the productive capacity of the earth. How are we doing? Find out in our “One Planet Annual Verification Report,” now available for download HERE. 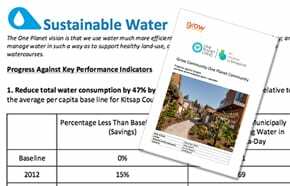 It’s Grow’s report on itself, a self-assessment of our progress toward Health and Happiness, Local Food and Sustainable Water, Culture, and other key indicators of a forward-thinking community. Every resident in our first neighborhood, the Village, has invested in a home solar system, making Grow the largest planned solar community in Washington State – and still growing as our next two neighborhoods build out! We’re proud of our success so far, and will strive with our residents to meet the goals of One Planet Living. It’s built into Grow Community by design, and comes with the lifestyle. Download and read the report HERE, and find out more about what Grow has to offer the earth, and you. https://growbainbridge.com/wp-content/uploads/2016/01/Bio_BioOPL_Colour_RGB_A-01-1024x270.png 270 1024 Grow Team https://growbainbridge.com/wp-content/uploads/2018/05/growlogo-300x110.gif Grow Team2016-01-04 19:02:222017-01-30 23:47:54One planet, one community, and one goal: a new model for sustainable living. Intentionally designed for unintentional connections – that’s Grow Community. 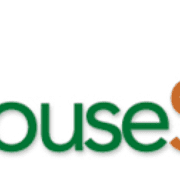 Lou Manfredini (NBC’s Today Show, WGN Radio) and the crew of HouseSmarts visited Grow this past spring, interviewing residents and exploring what is now Washington’s largest solar community just a few steps from Winslow town center. 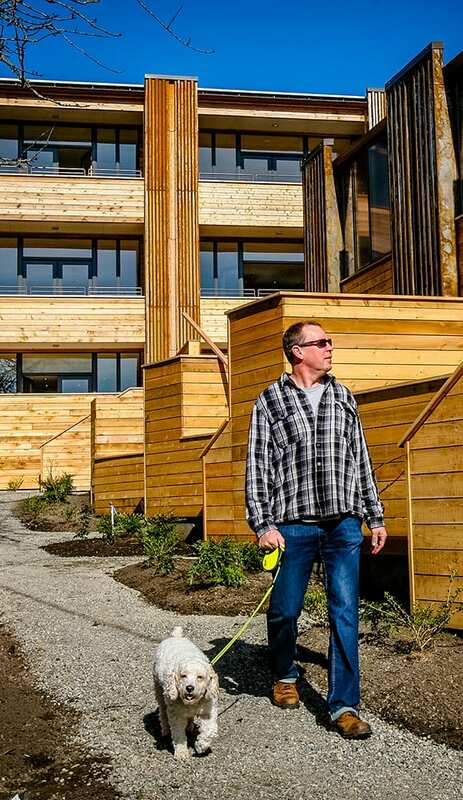 Manfredini liked what he found at Grow, praising the community for its modern design, neighborhood spirit, and forward-thinking renewable energy features. “These types of ideas, we can place anywhere in the U.S.,” the host says.